Text: Malachi 3:6 For I am the Lord, I change not; therefore ye sons of Jacob are not consumed. Background: A message from God to the Israelites which could have served as a reminder; as an assurance or as a warning to them. The book of Malachi was written about 100 years after the Israelites came back from the 70 years captivity/exile in Babylon. It happened that the years the Jews spent in exile from their land had made them forget some of the instructions and ordinances that were given to them by God; and so when they returned to Canaan 70 years later, the generation that came back had stopped obeying some of God’s instructions. Psalm 137 (they were weeping, not praying, not reading the Torah, not fellowship). As stated in Malachi, two of such ordinances are Tithes and Offerings. God asked Malachi to draw the attention of the Israelites to such areas. That though they might have experienced changes in life over time as a result of their years in exile and generational successions; but He as a God doesn’t change. He is the same before they went into exile; while they were in exile; and when they had returned from exile, and they should obey and reverence Him as such. Though the message today is not based on Tithes and Offering in particular, just as God sent to the Israelites thousands of years ago, it is a message to remind someone that God is Lord and has not change; for another, it is to assure that God is Lord and has not change; and to another person, it is to warn that God is Lord and has not change. There are several entities that are either revered as lord or call themselves lord. There is however only one who is called “The Lord”. It is that Lord that has sent me to you today. – There is a testimony shared by Pastor Agu at a leadership meeting that came to my mind in explaining this. During one of their outreach at a prison in the UK. A notorious inmate called ‘lord’ gave his life to Christ and started going to chapel, so every inmate starts to go, for those who stayed behind, his boys goes after them and say, ‘my lord says you must go to the chapel to meet the Lord’. There may be many ‘my lords’, but there is only one ‘the Lord’. That Lord has sent me to you. It may be a reminder; an assurance or a warning. I pray you to figure out which one. Nothing in life is permanent. A child is born today and everyone is happy, in not too distant future, the child has become aged and has passed on and so we mourn. All things are subject to change. Even Satan is not an exemption (he was in heaven, he now roams the firmament, later in the bottomless pit, finally in the lake of fire). It is only God that doesn’t change. He remains the same (Heb. 13:8). – In Joshua 1:1-2, God instructed Joshua to lead the children of Israel to the Promised Land after the death of Moses. But because of the difficult nature of the assignment (Moses was like a little god before them; Moses had the rod of God; Jordan, not a small river; more than 2 million people; what he has seen the people did to Moses), God had to remind him again and again that He is the Lord and that he should not be afraid. Joshua 1:1-2 – Now after the death of Moses the servant of the Lord it came to pass, that the Lord spake unto Joshua the son of Nun, Moses ‘minister, saying, Moses my servant is dead; now therefore arise, go over this Jordan, thou, and all these people, unto the land which I do give to them, even to the children of Israel. – There is someone here, you are afraid of an assignment, there is an obstacle like the river Jordan that you must cross, it’s like the crossing is not just you, but involves the lives of others too. Maybe you have looked at yourself and you have concluded that there is no chance you can cross over, I am asked to remind you that God is Lord and He has not changed. He will help you to cross over. You have even said that it would have been better if it’s just you. God says I should tell you all of you are crossing over. In John 11: 1-46, we read that Jesus allowed Lazarus to die from his sickness so that the glory of God might be seen. Jesus had taught Lazarus sisters that He is the resurrection and the life; despite this teachings, Mary and Martha thought if Jesus had come when Lazarus was still sick, there was hope, but now that he was dead, all hope had gone. In John 11:20-37, Jesus, however, had to remind them that He was not only the Lord over sickness but over death also. John 11: 39-40 – Jesus said, Take ye away the stone. Martha, the sister of him that was dead, saith unto him, Lord, by this time he stinketh: for he hath been dead four days. Jesus saith unto her, Said I not unto thee, that, if thou wouldest believe, thou shouldest see the glory of God? – There is someone here, you are just coming to Jesus just like Mary and Martha came to welcome Him; but not necessarily because you think He can solve your problem. I’m asked to tell you to keep reading Jer. 32:27 until you understand the sentence. Jeremiah 32:27 – Behold, I am the Lord, the God of all flesh: is there anything too hard for me? In Luke 24: 13-35, after the resurrection of Jesus, He appeared to 2 disciples walking from Jerusalem to Emmaus. They were troubled that Jesus who they thought was their messiah had been killed, and His body was missing. Jesus had to remind them of the Holy Scriptures how it had been written that all these had to happen for mankind to be saved. Their eyes soon opened and they believed. – There is someone listening to me now, there is something that you felt has come as a blessing to you, but you are not sure of that anymore. And that the glory of the later is always greater than the former. In Gen. 12:1-3, God asked Abram to proceed on a journey to the Promised Land and that He would make him the father of many nations, at this time he was 75 years old and had no child. Years down the line, he became discouraged, God had to assure him that it will not be his chief servant that would inherit him. Genesis 15:2-6 – And Abram said, Lord God, what wilt thou give me, seeing I go childless, and the steward of my house is this Eliezer of Damascus? And Abram said, Behold, to me thou hast given no seed: and, lo, one born in my house is mine heir. And, behold, the word of the Lord came unto him, saying, This shall not be thine heir; but he that shall come forth out of thine own bowels shall be thine heir. And he brought him forth abroad, and said, Look now toward heaven, and tell the stars, if thou be able to number them: and he said unto him, So shall thy seed be. And he believed in the Lord, and he counted it to him for righteousness. Again, years down the line, God had to assure him that it is not Ishmael he had in error that will be his heir. Genesis 17:15-22 – And God said unto Abraham, As for Sarai thy wife, thou shalt not call her name Sarai, but Sarah shall her name be. And I will bless her, and give thee a son also of her: yea, I will bless her, and she shall be a mother of nations; kings of people shall be of her. Then Abraham fell upon his face, and laughed, and said in his heart, Shall a child be born unto him that is a hundred years old? and shall Sarah, that is ninety years old, bear? And Abraham said unto God, O that Ishmael might live before thee! And God said, Sarah thy wife shall bear thee a son indeed; and thou shalt call his name Isaac: and I will establish my covenant with him for an everlasting covenant, and with his seed after him. And as for Ishmael, I have heard thee: Behold, I have blessed him, and will make him fruitful, and will multiply him exceedingly; twelve princes shall he beget, and I will make him a great nation. But my covenant will I establish with Isaac, which Sarah shall bear unto thee at this set time in the next year. And he left off talking with him, and God went up from Abraham. – God asked me to assure someone here that He has not forgotten you. It may appear so to you, but He has not. – Someone here, you are concerned of time. That time is going. You always think that if only you are still a particular age, things would have been better. For you, in particular, God says He will still time. Time will not go for you. To another person, He says He will exceed your Ishmael. You thought the coming of ‘Ishmael’ was the blessing you have been waiting for, but no. God said that the blessing of Ishmael will be exceeded. As Jacob was running away from home because of the fear of Esau, a lot of negative thoughts would be going through his mind: all that his father had will be seized by Esau, his father’s funeral in his absence, will he ever meet his mother again? Will he ever return to Canaan? But in Gen. 28:10-15, God assured him that he would bring him back and that he would be prosperous. Genesis 28:10-15 – And Jacob went out from Beersheba, and went toward Haran. And he lighted upon a certain place, and tarried there all night, because the sun was set; and he took of the stones of that place, and put them for his pillows, and lay down in that place to sleep. And he dreamed, and behold a ladder set up on the earth, and the top of it reached to heaven: and behold the angels of God ascending and descending on it. And, behold, the Lord stood above it, and said, I am the Lord God of Abraham thy father, and the God of Isaac: the land whereon thou liest, to thee will I give it, and to thy seed; And thy seed shall be as the dust of the earth, and thou shalt spread abroad to the west, and to the east, and to the north, and to the south: and in thee and in thy seed shall all the families of the earth be blessed. And, behold, I am with thee, and will keep thee in all places whither thou goest, and will bring thee again into this land; for I will not leave thee, until I have done that which I have spoken to thee of. – There is someone here, just like Jacob you went out empty. God says you will come back in full. To another person, He says you may be using stone as a pillow now, but very soon you will be using the finest of cotton. When Moses was preparing to die, he gave the children of Israel words of warning from God. That a time will come when they have settled into Canaan properly, that they must not forget God. Deuteronomy 31:16-22 – And the Lord said unto Moses, Behold, thou shalt sleep with thy fathers; and these people will rise up, and go a whoring after the gods of the strangers of the land, whither they go to be among them, and will forsake me, and break my covenant which I have made with them. Then my anger shall be kindled against them in that day, and I will forsake them, and I will hide my face from them, and they shall be devoured, and many evils and troubles shall befall them; so that they will say in that day, Are not these evils come upon us, because our God is not among us? And I will surely hide my face in that day for all the evils which they shall have wrought, in that they are turned unto other gods. Now, therefore, write ye this song for you, and teach it the children of Israel: put it in their mouths, that this song may be a witness for me against the children of Israel. For when I shall have brought them into the land which I sware unto their fathers, that floweth with milk and honey; and they shall have eaten and filled themselves, and waxen fat; then will they turn unto other gods, and serve them, and provoke me, and break my covenant. And it shall come to pass, when many evils and troubles are befallen them, that this song shall testify against them as a witness; for it shall not be forgotten out of the mouths of their seed: for I know their imagination which they go about, even now, before I have brought them into the land which I sware. Moses, therefore, wrote this song the same day, and taught it the children of Israel. – This is my song to you, even though I’m not about to die. God is saying many of us have eaten in the UK and become satisfied and are prospering, therefore have turned to serve other gods, especially Mammon (god of material wealth, anything that promises you more money, greed, an undue pursuit of gain) in the place of God. He asks me to warn such people to repent. There are many among us who were fervent as students or on work permits, but as soon as they become permanent resident or citizens, God is out of their picture. There are some who were single and were fervent for the Lord, but as soon as they become married, God is out of the way. There were those who were trusting God for the fruit of the womb, but as soon as they have a child, the baby becomes their god. There are those that were fervent when they had no gainful employment, but as soon as they got a good job, God is the last thing on their mind. Talk less of tithing. God says I should tell you, He is the Lord, He changes not. In Revelation chapter 2 and 3, God wrote letters to the 7 churches in Asia. 2 of the churches received commendation (Smyrna & Philadelphia) while the other 5 received warnings. Theologians have said that the characteristics of the 7 churches represent the dichotomy of the kind of Christians we have today; and the kind of churches that exist. Which may imply that for every 7 Christians or 7 churches, 2 may be sound, and 5 may not. The question is, which group do you belong? The 5 warnings to be viewed as individual persons. – The Ephesian church was told that they had left their first love and should do first works. – The Pergamos church was told that they were upholding the corrupt teaching of Balaam and that of Nicolatans (mislead into idolatry, fornication). Your teachers are on the internet. They were asked to repent. – The church at Thyatira was said to have tolerated Jezebel who was misleading people. That her followers will be killed if they do not repent. Do you have a Jezebel deceiving you? – The church in Sardis was said to have a reputation that they were alive but they were dead. They were asked to wake up and strengthen what remained which were about to die, for their deeds are not perfect before God. – The church in Laodicea was told that because they were not hot nor cold, but lukewarm, they would be vomited out by God, except they repent. In Mal. 1:6-11, God brought the attention of the Jewish priests to the bad offerings they were accepting from the people and were sacrificing such to Him. They were warned to desist from such to avoid punishment. Malachi 1:6-11 – A son honoureth his father, and a servant his master: if then I be a father, where is mine honour? and if I be a master, where is my fear? saith the Lord of hosts unto you, O priests, that despise my name. And ye say, Wherein have we despised thy name? Ye offer polluted bread upon mine altar; and ye say, Wherein have we polluted thee? In that ye say, The table of the Lord is contemptible. And if ye offer the blind for sacrifice, is it not evil? and if ye offer the lame and sick, is it not evil? Offer it now unto thy governor; will he be pleased with thee, or accept thy person? Saith the Lord of hosts. And now, I pray you, beseech God that he will be gracious unto us: this hath been by your means: will he regard your persons? saith the Lord of hosts. Who is there even among you that would shut the doors for nought? neither do ye kindle fire on mine altar for nought. I have no pleasure in you, saith the Lord of hosts, neither will I accept an offering at your hand. For from the rising of the sun even unto the going down of the same my name shall be great among the Gentiles; and in every place incense shall be offered unto my name, and a pure offering: for my name shall be great among the heathen, saith the Lord of hosts. – Our personal relationship with God (prayer, word, meditation, fellowship with others). – Our giving to God/or to the things of God (do you pay your tithes? Are you a cheerful giver? What financial support do you give to God’s work?). God can’t be mocked. The word has gone forth. Is it a reminder to you? Is it an assurance? Is it a warning? Is it a bit of each? Let’s go to God in prayer. – As a reminder – Pardon my memory loss. – As an assurance – Pardon my unbelief and doubt. Father, show the whole world with my life that you are the I am that I am. 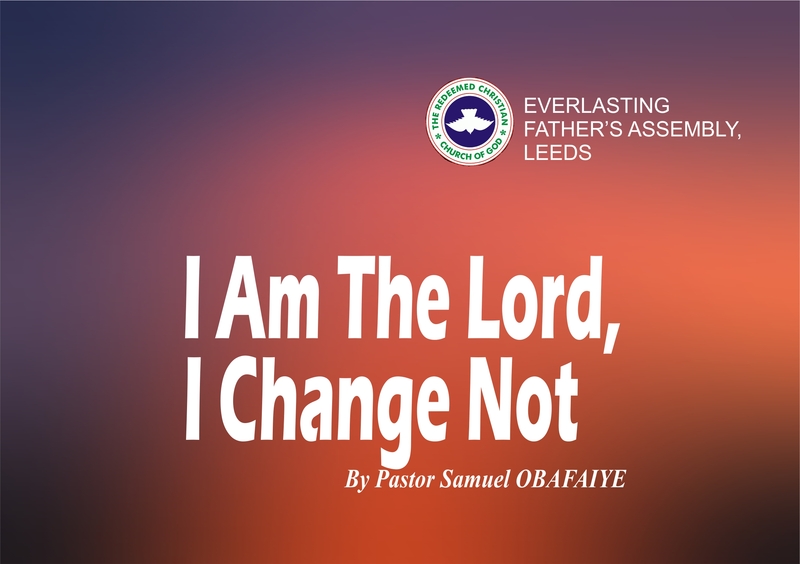 The sermon, I Am The Lord, I Change Not, by Pastor Samuel Obafaiye, was delivered on August 26, 2018.